Emerging research points to the long-term effects of even mild traumatic brain injury (TBI), which can leave victims with memory problems and reduced cognitive skills. 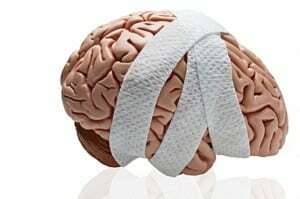 To date, most studies on TBI have focused on the impacts of severe and chronic cases, but researchers at the U.K’s Newcastle University wanted to explore how seemingly minor brain injury can damage delicate tissues, rendering lasting damage to nerve cells. The study was published in the online medical journal Neurology on July 16. Concussion and minor head trauma are other names for a mild traumatic brain injury – a condition that is often sustained by sudden blow or jolt to the head. According to lead study author Dr. Andrew Blamire PhD, the research team examined patients who had suffered clinically mild injuries from common accidents such as bicycle falls, or slow-speed car accidents. Since some 90 percent of all clinically diagnosed TBIs are mild to moderate, their findings are especially relevant. The researchers’ study group included 44 patients who had suffered a mild traumatic brain injury and nine patients with a moderate TBI. Both groups were compared to 33 patients in good health, with no brain trauma. All participants partook in memory and thinking skills exams, while their brain activity was monitored with diffusion tensor imaging scans that detect brain cell damage and identify nerve cell activity. TBI patients were scanned six days following their injury and again one year later. Individuals with mild to moderate TBI , according to the tensor scan, showed disruption to nerve axons that interrupted how brain cells communicate to one another. Compared to healthy participants, those who suffered a brain injury scored 25 percent lower on a test designed to measure memory and thinking skills. One year later, participants took the tests again and scored the same – both patients with and without brain injuries. Concentration difficulties, memory problems, dizziness and visual disturbances are common symptoms of a mild TBI, but unfortunately these signs are frequently subtle or go undetected by the injured victim, his family or his physicians. At Hardy, Wolf & Downing, our Maine traumatic brain injury lawyers know that this delayed or subtle manifestation of TBI symptoms can happen weeks after the fact, leaving victims in the dark about the gravity of their situation. Once diagnosed through MRIs or other brain scans, a traumatic brain injury – whether mild or severe – can be incredibly frustrating and expensive to treat. Slow-motion bumper fenders, bicycle accidents or even minor slip and falls can lead to a concussion. In cases where negligence was involved, TBI victims are encouraged to seek legal representation to ensure their rights are fully protected. If you are suffering from confusion, headaches, mood swings, sleep disturbances or memory loss in the wake of an accident and suspect you may have experienced a mild TBI through no fault of your own, you may be eligible for monetary damages. Portland and Lewiston residents have relied on Hardy, Wolf & Downing for more than 40 years, securing maximum compensation with the expert counsel of our compassionate and highly-skilled team. We will fight for appropriate reparations to account for lost income, medical and hospital costs, reduced earnings and emotional suffering. To schedule a free case evaluation with a Maine personal injury lawyer today, please call 1-800-INJURED.